Certain adventures only come around once. Like when the grizzled old warrior decides to go after the dragon, and asks who’s coming with him. Or when the dark-eyed sorceress slowly surveys the crowd of peasants, waiting for one to step forward and pull the sword from the stone. The Thief Lord’s Vault, a 32-page adventure module for levels 4-6 that sends the heroes into the legendary treasure vault of Cazül the Chaotic. So take up your broadsword, blow the dust off your spellbook, and saddle the horses. The mailed Kings of the North are calling out your name, demanding an audience. It is up to you to give an answer. RPG Now: 4 stars. "I'm currently running my second adventure in the DCC universe, and already the Known Realms Gazetteer has proved invaluable in helping me answer my PC's pesky questions about the local climate and where certain roads and rivers referenced in the adventure might ultimately lead to." EN World: 5 stars. "Great value for your buck; original without being weird... You will in no way regret buying this." Will the preview PDF links get fixed at some point? 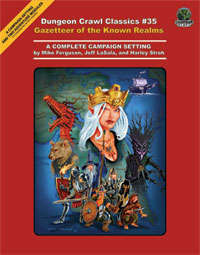 Is there a preview of the actual gazetteer anywhere? 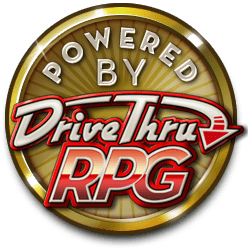 Did you miss the part in the description (underneath the listing of contents) where they offer free downloads of part of the GM's Guide and Gazetteer? Or were you looking for something else? You mean the links that lead to an "Resource DCC35-Preview-2.pdf not found." error? Yeah, don't worry, I did not miss them. This title was added to our catalog on October 21, 2006.